While their titles have slowed, it's impossible to overlook the storied Maple Leafs franchise. 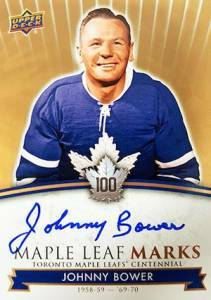 Celebrating 100 years on the ice, 2017 Upper Deck Toronto Maple Leafs Centennial honors a century of greatness for the Canadian powerhouse. Found in several formats, the UD Maple Leafs Centennial set looks to be fairly simple with mainly just a base set and various hits. Reaching across the team's history, the 200-card base set takes collectors on a journey from the earliest stars to the young studs of today. This also includes 100 Base Short Prints, making the set build more of a challenge. Blue Maple Leaf Die-Cut (1:1 packs) parallels put even more emphasis on the Maple Leafs logo with a unique look. Only found in 2017 Upper Deck Toronto Maple Leafs Centennial tins, the manufactured Championship Banner patch toppers measure 3.25" by 8.5". 2017 Upper Deck Toronto Maple Leafs Centennial hits include the signed Maple Leaf Marks (1:24 retail; 1:48 blaster/tin) in Single, Dual, Triple and Quad versions, and AKA Autographs. 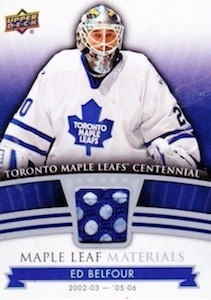 The main relics come in the form of Maple Leaf Materials (1:93 retail; 1:159 blaster/tin) inserts. There are also very rare Maple Leaf Materials Duos and Maple Leaf Materials Trios editions along with the game-used Treasured Relics set. 16 17 UD Black Diamond John Tavares Auto 99! Toronto Maple Leafs! Odds key: h=hobby, r=retail, b=blaster, t=tin. PARALLEL CARDS: Blue Die-Cut (1:1 h/r/b/t), Gold #/100 (Hobby), Blue Exclusives #/99 (Blaster), Green #/25. Overall odds - 1:1 hobby/retail/blaster/tin. PARALLEL CARDS: Gold #/100 (Hobby), Blue Exclusives #/99 (Blaster), Green #/25. Overall odds - 1:12 hobby; 1:24 retail; 1:48 blaster; 1:48 tin. Overall odds - 1:510 Hobby packs. 13 cards. 1 per tin. Shop on eBay. Overall odds - 1:93 hobby; 1:193 retail; 1:158 blaster/tin. Overall odds - 1:792 hobby/retail; 1:1,346 blaster/tin. Overall odds - 1:2,376 hobby/retail; 1:4,039 blaster/tin. I can’t wait for more details on this set as a die hard Leafs fan. Although I really hope that the final cards do not exactly match the mock ups. 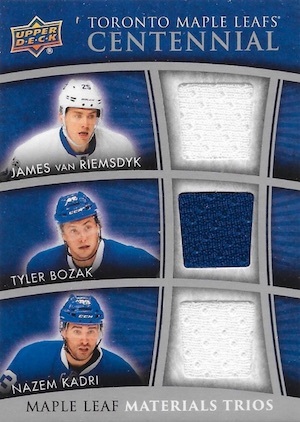 A little too plain and they used the old Leafs logo instead of the new (much more beautiful) one as background for each player in the base set. I really hope they go with the new logo instead for the final design. The President’s Choice product was full of Leafs history and have some beautiful cards. Autographs galore and plenty of vintage memorabilia. I hope Upper Deck can come close to that product but I have agree with Mark that the mock ups with the old logo is disappointing. The new logo is more traditional and since this will be a retrospective set commemorating the 100 year history, that logo seems more apropos. I am interested in the player selection as well and which players have signed cards and the memorabilia available. The banners is a nice touch. As a life long fan of the team I will likely buy a few boxes and hope for some good pulls. Everything I can find about this product online only mentions retail boxes, tins and blasters. Even the pre-sale available at CloutsnChara.com only lists those 3 formats. I was just looking for some clarification; is there indeed a hobby box that will be released for this product that will feature better odds for hits and/or exclusive content compared to the retail boxes? Or is it just the retail boxes that are available and that was just a typo? These are solicited details for a hobby format that includes exactly what is listed. This is different from the retail boxes. I’ve seen hobby boxes advertised for pre-sale so they exist. There are only two Maple Leaf fans on here talking about this product. Pre-1967, a little 1992, and Auston Matthews is the only thing Leaf fans can celebrate. I hope you do not pull Travis Green and Alex Steen autographs. I would hope there are Johnny Bower, Dave Keon and other greats from the past. I am sure this will sell great in the GTA. Please be hard signed and not stickers. LOL. No dave Keon ? No mats sundin ? No Curtis Joseph ? Who makes these checklists ? Was excited to build this set but I just don’t want a bernier card instead of Joseph in my house and Jonas hoglund instead of mats sundin. How can you mess this up ? I’m talking about base cards atleast if these guys don’t want to sign. Many holes in this checklist. Missing three key captains. George Armstrong (longest serving Captain), Dave Keon (Voted greatest Maple Leaf of all time, and Mats Sundin (all time leading scorer in franchise history). Also missing are legends Busher Jackson, Joe Primeau, Turk Broda, Hap Day, Max Bentley, Red Kelly, Bob Pulford, Tim Horton, and Andy Bathgate. Hall of Famers all. Then there are players who made significant contributions like Paul Henderson, Sid Smith, Errol Thompson, Curtis Joseph, and Nick Borashevsky missing. Instead there are about as many guys who had a cup of coffee, and maybe a quick sandwich, with the team and left no redeeming memory on the franchise. Upper Deck screwed this list up. They should have hired someone who knows a thing or two about hockey and the Maple Leafs in particular, got in touch with living Leafs legends and the families of those that are deceased, to put together a genuine 100 year tribute set. Hell even Conn Smythe is not even included!! How about the greatest hockey broadcaster ever in Foster Hewitt? He made the Leafs popular from the beginning. I was sao looking forward to this product when iot was announce. Now I am soo disappointed I will keep my money and cheer on my life long beloved team and stay away from UD products because it is now painfully apparent, UPPER DECK HAS NO CLUE ABOUT HOCKEY OR HOCKEY HISTORY!!!! Also just noticed that Teeder Kennedy is not in the set, but Red Kelly is. My mistake. A couple of the players in my previous rant are in the cut signatures. Still the the omitting of so many great legends from a retrospective set is beyond comprehension. Very, very disappointing product. I used to live UPPER deck but they are ruining the hobby with hockey now. Was honestly thinking of purchasing 3 cases but will buy a few singles in the secondary market now. What a joke of a checklist. Dion phaneuf??????? Great choice ! How about make a die cut short print of him shaped as a pylon , won’t be purchasing any of this either rather I will watch breaks online and have a good chuckle with money still on my wallet. I’m not a Maple Leafs fan so I admit I don’t know who should be in the checklist or who shouldn’t, but Mats Sundin!!! I mean come one guys. I really don’t understand it. I can’t believe they would leave out guys like Sundin, Joseph, Palmateer, and how can you leave out Tie Domi. Among others like Pat Quinn, Roger Neilson, but you make a Carlton the Bear. Shame on you Upper Deck!!!! UPPER deck needs to stay away from hockey. I had fun cracking open boxes but now products are so watered down with little to no thought about their customers. Well, after 4 hobby boxes and a tin I think I have an opinion to share. I was a bit disappointed with the quality of the base set. We are paying the price you’d pay for Upper Deck Series I and II, and yet getting the card quality you get with the MVP product. 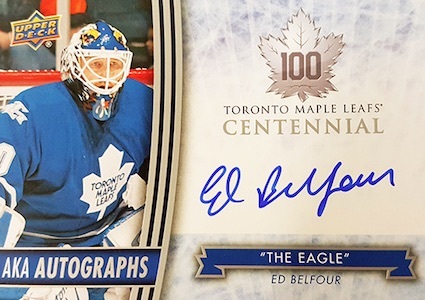 Some of the Maple Leaf marks are interesting (they must have gone to a lot of trouble to get that many old guys to sign cards), but the die cuts are very lackluster. The set would have been much more fun with a canvas parallel. Oh and it looks pretty obvious that there may be a series two due to so many key people not included in this set, so I’ve taken the liberty of providing Upper Deck with this Series II checklist (just to make sure they don’t miss anyone). Oh, and the Maple Leaf Marks I did get I was very disappointed with. I thought with 4 hobby boxes, I’d at least get one auto card of a star player. I guess Ron Ellis was somewhat of a star, so I’m happy about that one, but the others were guys like Bill Berg, Gary Valk, Kyle Wellwood? I understand getting unlucky but fans deserve more than that when they spend 600 bucks. One nice hit in my whole case.. As for all the above comments… I wonder if all the missing stars was on purpose so UD can hit us with an update set…. or inserts in SP Authentic !!!!! 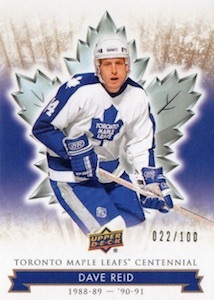 I agree with the others about this set – so many missing star players of the Leafs history. It’s certainly not a true history of the 100 years of the Maple Leafs. I also bought a case – with only the Leaf Marks as hits, along with a couple of mundane blah jerseys as well – no big hits at all! Very disappointing to say the least!!! Not one of your better efforts, Upper Deck! Definitely not worth the price!!! When I saw Carlton for card #100 on a checklist, I just figured they forgot the first name of the player, then it dawned on me, the freakin’ mascot bear !? All most collectors/fans now-a-days want is Marner, Matthews and Nylander, I think dealers will be stuck with tens of thousands of unwanted cards. I am disappointed Aki “Ice” Berg didn’t get a card ! Go Leafs Go ! Will save my $ to attend a game or two. My wish list: Harold Ballard and King Clancy in the Bunker series. Paper bag fans. Leafs 4 series wins over Sens. Stanley Cup moments/action cards. Salute gate. Dion and Phil Kessel playing ping pong. McCabe getting rag dolled by Chara. Toskula miscue on goal from other end of rink. Belleville Bulls Trio First Round pick card. Clark’s hit on Bell. Andy Frost and Joe Bowen cards, with lil’ audio computer chip for sound. All in retro package design for 25 cents ! Really wish I had viewed the checklist before buying! Gawd awful. Just how does this celebrate 100 years?! No Sundin? The base set should have been the top 100 of all time. 1 Keon card, an auto out of 5?! To U.D., I say WTF! From looking at the product, there is not much to say unless you pull the Matthews autograph. Same as the history of the Leafs unless you are older then me and you were around in 1967. 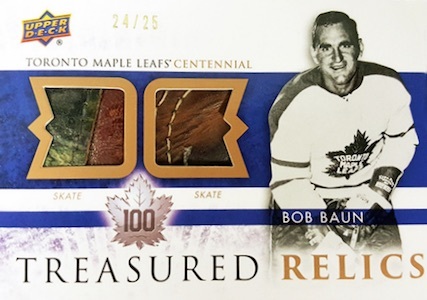 I did notice people spending money on Red Kelly and Bobby Baun autographs that you can purchase for next to nothing from previous sets. Man what a s*** set. Die hard fan and I was expecting something a little more high end from Upper Deck for one of the most famous franchises in hockey history. WHAT A DUD. LEAF FANS SPEND YOUR MONEY ON IN THE GAME OR LEAF. THIS STUFF IS PURE S***. NO Company should have the “Monopoly” on any Sports Cards. I Agree with “Dave” Upper Deck will most likely put update cards in another one of their many brands like they do with the “Young Guns” etc I’m Sure UD Doesn’t Care if we buy any of their products Collectors will Buy Buy Buy until they have had enough of the Bull**** BUT Collectors are born every minute & the UD Fortune Grows & Grows SO WHY WOULD THEY CARE!!!! “TIME to Spend OUR $$$$ on “VINTAGE O-Pee-Chee & Parkhurst” At least a Card that sells for say $50 is still selling for $50 down the road not like a $50 Card today that will sell for $5 in a few weeks!!! I’m not a collector of modern cards (last box I bought was Pro set back in 1990!). As a Leafs fan I was really looking forward to this set and buying a box. Cards look great! Then as I went through the checklist I got pretty disappointed. No Keon, Armstrong, Kennedy, Sundin, Duff, Horton, Stanley, Henderson….and the list goes on. I don’t understand-why all the missing players? I’ll buy a few singles of my favourite players but that’s it-not worth buying a box! They did the same thing with the Centennial Habs…let me explain. On the HOF, Duals, cards they numbered them…logical…BUT… On the INKS cards they did not! Becket lists some of them as SP (Short Prints)…and the price for these SP is thru the roof. So I contacted them (UD) to find out how few cards were signed to be considered as SP…answer…If they are not numbered we do not know!!!?? ?…STUPID answer to say the least! Also, a boxed set was issued with CDs, lapel pin and 14 cards with “Limited Edition” written on them (287-300)…again they do not know how many! Do it right or not at all…better yet, let your competitors show you how to do it!!! Wait a colossal waste of money. I bought a hobby box and 2 tins. My best card was 5hole Alan bester autograph. I did pull an auto redemption card but looking at the list thats going to be s..t as well. Why not include sundin? Tie domi? Cmon. The least they could have done is number the cards in order of date range. I put this set in order in a set binder and I got AM34 next to bob rouse and bob neely, ya who right?. Some thought and consideration here would have at least made it nice to look at in numbered order. Just a waste of time and money. How can you do this to a Leaf 100 year set? Can you tell im disappointed? Only two autos in a box is ridiculous for the price. The jersey cards are nothing special and are way too difficult to pull. So many great players were not included. The cards are well designed and nice to look at but they really dropped the ball when they put this checklist together. I’m wondering if UD or the leafs maybe had a falling out with some players because this mediocre checklist makes no sense. Or perhaps a follow up set to come? The card design is nice. That is where the good points end. They ROYALLY butchered the checklist. Countless Maple Leafs greats are not included while there are tons of guys who play a couple seasons here and did NOTHING! And then the hits, which are so few and far between, that when you do finally pull an autograph; it’s Jason F***ing Blake… it really makes you want to hurt your yourself just so you can feel something. Even worse, I bought one tin, and other then 4 lousy die-cuts, there was not one single insert card in the whole tin. NOT ONE SINGLE INSERT CARD IN THE WHOLE TIN! I’m done my review. Upper Deck could have easily hit this one out of the park with the countless millions of Maple Leafs fans (myself included) but instead we are all just disappointed, as usual. Though the tins are nice and the card quality is pretty good and I like the Stanley Cup mini-banners in the tins a lot, the player selection is horrible While omitting Dave Keon , Mats Sundin ,Curtis Joseph, Tim Horton and George Armstrong they included the likes of Bob Rouse ,Garry Valk and Jonas Hoglund. I contacted Upper Deck today and they told me it was a contractual rights issue and couldn’t include these players.Very disappointing. Full disclosure. Habs fan here. But I am also a fan of hockey history. I expected the Leafs set to bring things up a notch from the Habs set from 2009. I was very disappointed. Besides the obvious player misses that people have covered, (no Tiger Williams is a crime!) the lack of inserts is a joke. Basically an autograph card is a possibility but not bloody likely. I don’t know who put this set together but they have done a disservice to a momentous occasion. Just like the team, this set falls well short of expectations while fleecing the maximum cash from their fervent fan base for an inferior product. Even the banners seem cheap! 1- Brutal, so disappointing. Upper Deck should be absolutely ashamed of themselves. NO SUNDIN? NO HORTON? NO TIGER? NO HENDERSON? I’m done with Upper Deck. I’m not spending another dime on their products. Incredible incompetence. No Keon,named greatest Leaf of all time last year.No Horton.no Plante,who as the starter in 70/71 posted a 1.88 avg and had the highest save pct. ever..behind one of the worst defence corps ever. VERY DISAPPOINTED,slap in the face to all Leaf fans. Great product. 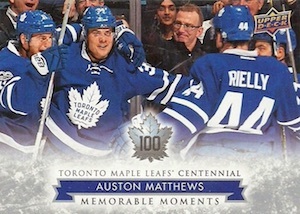 Beautiful looking cards, awesome inserts, And great variety of players from the Leafs 100 year history. A must have for any Leafs fan and hockey card collector. Can someone explain why UD isn’t honoring the auto redemptions from the retail blasters? Hard-signed autos + SSP make this a tough but fun set to pursue. This product is despicable and that is an understatement! I purchased 4 metal cans and 6 x 9 pack boxes, no hits, no auto, no nothing. I remember one serial numbered card of 99! Im serious….over $300 for worthless cardboard. I agree with all the other unsatified customers above, it seems like Upper Deck is making so much money doing every card, i.e. Parkhurst, OPC, Tim Hortons, etc. basically everything Panini isn’t….that the thought of quality versus quanity has fell off the tracks…its a sad day when I am thinking of comparing Upper Deck with the always crappy Topps, the cheap cardboard kings for decades. When I got my first Upper Deck hockey & baseball sets in 1989 & 1990…I gave up buying anything else, well the dream is over California! What an insult to the biggest reason there is an NHL, the highest money making team the NHL has…of course a Stanley Cup, which in my case was last seen when I was 7, is long overdue! !